In light of what has been happening to our friends in Austin, if you see a suspicious package or receive a package you did not purchase. Do not touch it or open it, immediately call 9-1-1. If you observe a suspicious package with noise, powder, liquids or suspicious wiring call 9-1-1. If you see something, say something. Let's keep everyone safe. The Stone Oak area is lucky to have two SAPD SAFFE officers. They welcome your questions, and schedule permitting will try to attend your HOA meetings upon your request. Please also remember Stone Oak has a very active Neighborhood Representative Committee that is utilized to spread word throughout Stone Oak. Please check our Neighborhoods of Stone Oak page to see if someone is representing your neighborhood on this committee- if not, please consider being the representative. The meetings are the second Wednesday of each month (with the exception of December and January) at 7:00PM in the Director's Room at the Club at Sonterra, and are kept to one hour. Speakers in the past have included SAPD, SAWS, SAFD, CPS, City of San Antonio, and others. Important information is given to the reps to take back to their neighborhoods, and spread among their neighbors. This committee has become a valuable source to all these entities to ensure emergency information is spread quickly- such as water main breaks, or street construction issues. Call our office at 210-490-9481 if you have any questions regarding the Committee. Were you one of the many Stone Oak residents affected by the recent increase in mail thefts? 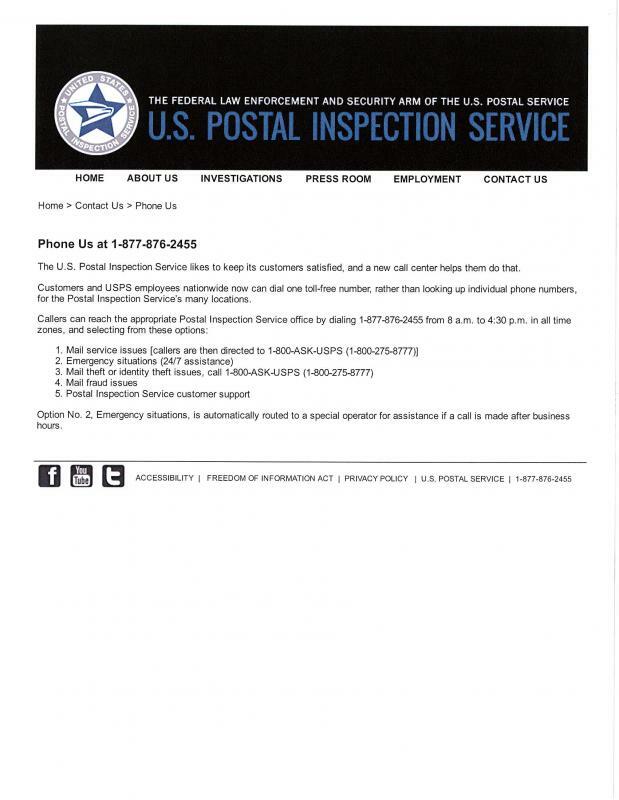 Please see the below message from US Postal Inspector Robert Strande. It is important to note, according to his office, and the SAPD, due to current legislation only allowing minimal punishment, this crime is increasing in occurrence, and will continue to do so until stronger laws are established. Please help now! Texas State Representative Ina Minjarez, District 124, has authored Texas House Bill (HB) 1747, creating a Texas mail theft statute. Your residents can support her bill by contacting their TX State District Representative and/or Texas State Senator to encourage support of Texas HB 1747. (Updated 2-9-17) Postal Inspector Rob Strande attended the February Neighborhood Representative Committee meeting 2/8/17. 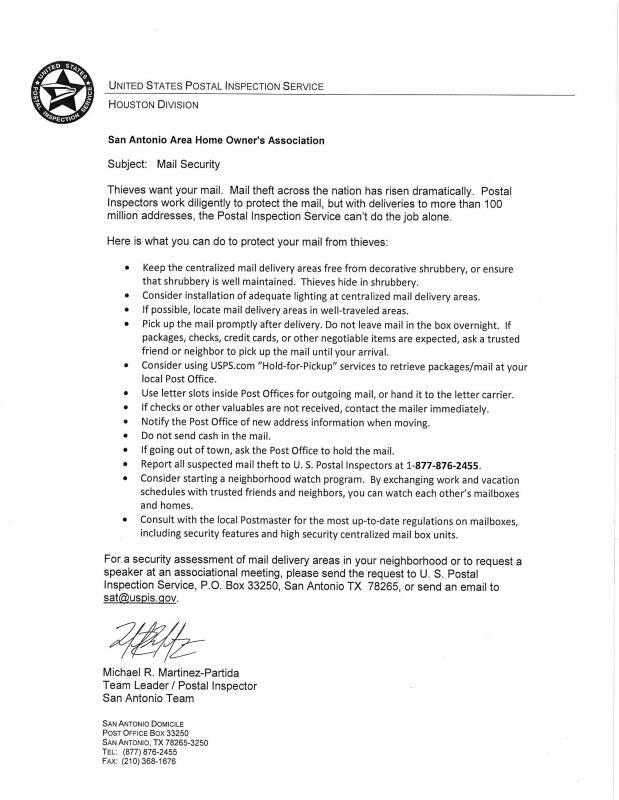 You can read his letter regarding Stone Oak mail security by clicking here. We also have a photo of the letter below. Our SAPD SAFFE Officer Jerry Hernandez was also in attendance, and explained this crime is only increasing, and residents need to be aware it is not a matter of "if" it happens to you, but when. He strongly suggests enrolling in a credit monitoring service, and checking your mail DAILY. Due to minimal punishments available for offenders, Inspector Strande is working on trying to have Texas legislation passed that will entail longer jail terms and more detailed punishments. He urges you to contact your legislators and vocalize your experiences, and desire for this issue to be addressed immediately with tougher laws. At the 2017 Stone Oak Annual Meeting of Members Officer Dennis Quinn answered questions regarding the multiple mailbox break-in occurrences in the Stone Oak area. He implored residents to check their mail daily, possibly set up a credit-monitoring service, and utilize online statements and banking as much as possible to lessen the threat of identity theft. It was also noted to all in attendance, all cluster mailboxes are owned by, and are the responsibility of, the United States Postal Service. They are not the responsibility of, nor can they be repaired, maintained, or secured by the HOAs or the POA. Turning back the clocks means time for a new smoke detector battery. 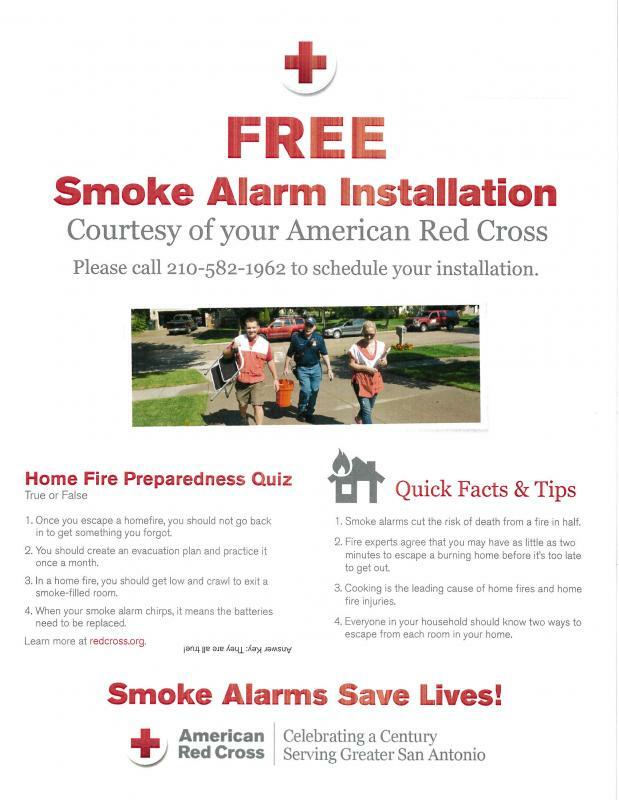 The American Red Cross offers free smoke alarm installation for homes without smoke detectors or homes that have defective smoke detectors. Call the American Red Cross with any questions at 210-224-5151. (Updated 10/27/16) By now you have most likely seen the construction underway on the new stoplight at the intersection of Stone Oak Parkway and Arrow Hill. This light will replace the current 4-way stop signs- something that has been requested by many Stone Oak residents for a long time. As has been mentioned in previous newsletter articles, posted on our website, and discussed at Neighborhood Representatives meetings, your Stone Oak POA Board of Directors took considerable time researching this project, evaluating its potential, and working with the City of San Antonio to make it a reality. After many meetings with representatives from the District 9 Council Office and the City of San Antonio Traffic and Capital Improvements (TCI) department, it became apparent if this project was going to happen for the property owners of Stone Oak, the POA was going to have to contribute funds. The result was a joint agreement with the City that included the City paying for all needed traffic studies, overseeing project management, having responsibility for the design of the light, and for all future maintenance, while the POA provided the funding for the construction phase. If the project costs are less than expected, the difference will be refunded to the POA upon completion. As a result of strategic savings and close financial supervision over the years, the POA was able to provide the funding to improve the traffic flow at the Stone Oak Parkway and Arrow Hill intersection. The project should be complete by the beginning of 2017, and TCI will then observe traffic patterns, and adjust all Stone Oak Parkway stoplights as needed. As always, we encourage you to continue watching our website for any updates, and register your email with us to ensure you receive our e-blasts. Be assured we only send a few a year, do not share your email with any other entities. You can opt-out of receiving them at any time. We also encourage you to get involved in your community, including your HOA, to ensure you always have the most up-to-date information about what is happening in Stone Oak. Thank you for being part of Stone Oak! As we have always stated, we welcome your written comments through our "Contact Us" page, or in writing to our office at 19210 Huebner Road, Suite 100, San Antonio, TX 78258. Please continue to check our website for further updates. Summer is here, and along with the heat, we typically see a rise in overnight vehicle burglaries. Unfortunately, this summer is already proving to be no exception. One commonality in many of the burglaries that we are seeing, is our victims are leaving valuable property in the front seat of an unlocked car. While this does not make anyone any less of a victim, your odds of being victimized multiply with this behavior. * DON’T LEAVE VALUABLES IN PLAIN SIGHT, AND/OR IN UNLOCKED VEHICLES!!!!!! * Be vigilant. If you see something or someone that appears out of place, your instincts could be correct. Call police (non-emergency or 911 as needed) and be a good witness. * Talk with your neighbors. They see things that you may have missed, and vice versa. One person may not have all of the information needed to address this issue, but sharing information among yourselves could prevent future victimization or could even assist police in apprehending actors. 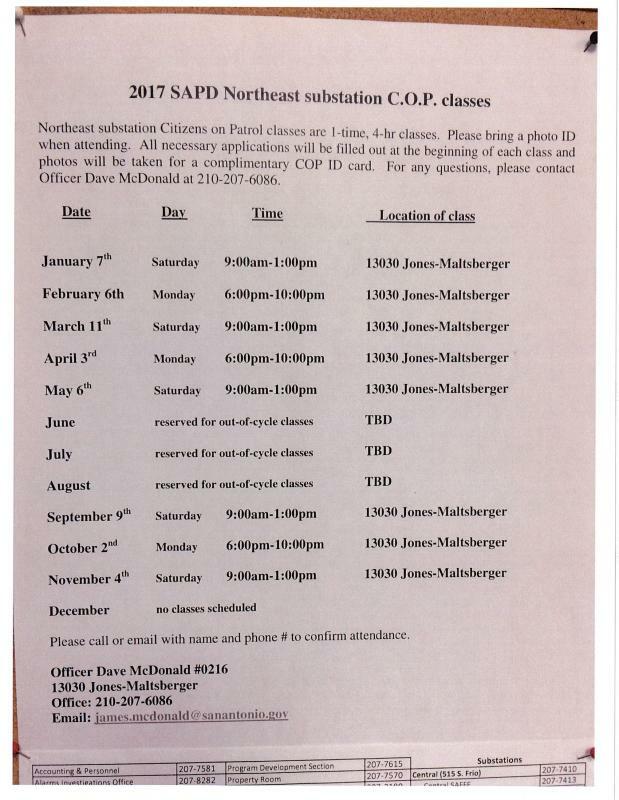 For specific information regarding your neighborhood, contact your SAFFE officer. As you may know, San Antonio City Council has passed a "Hands Free" driving ordinance. 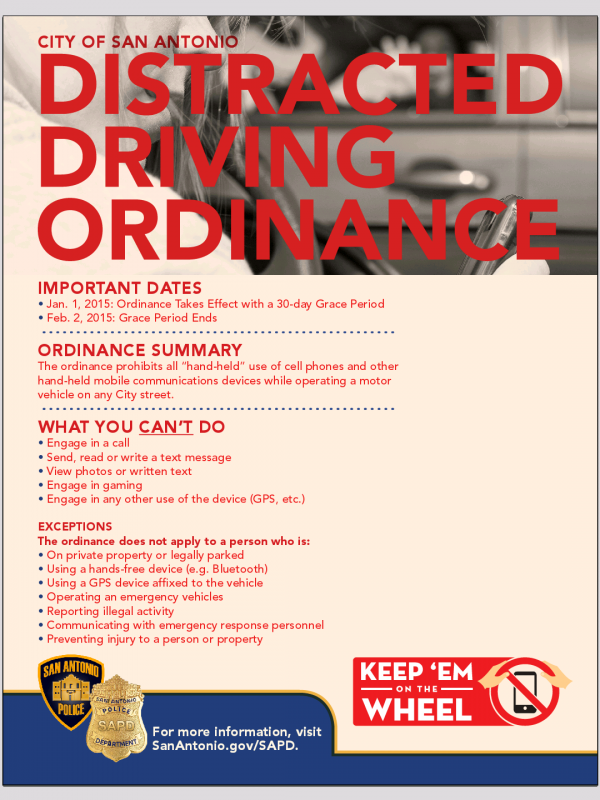 This means, starting January 1, 2015, it will be illegal to drive while using any hand held mobile device to talk or text. We plan to spend the next several weeks getting information out to the public via social and mainstream media. Please help us spread the word through your communities so our fellow residents are aware of this and start getting into the habit of putting down those cell phones when you get behind the wheel. KEEP 'EM ON THE WHEEL, SAN ANTONIO! Thank you for all you do to help make your neighborhoods and the greater San Antonio area a safe place to live, work, and play. It is important to note this also implies when you are stopped at a stoplight or stop sign! Our office has been contacted by Jessica Alderson of Texas Parks and Wildlife regarding recent photos making the rounds on Facebook and other social media sites. NONE of these photos were taken in the Stone Oak area, or surrounding vicinity. Again, NONE of these photos are from the Stone Oak, or surrounding areas. Please ensure this message is passed to your friends and neighbors. Park Police have asked if you sight a mountain lion, please call Texas Parks and Wildlife at 210-688-6444. They prefer to speak directly to the person who sees the animal. On February 9, 2014 between 11:00 and 11:30 PM we had an attempted vehicle break in in the 27000 block of Wild Springs in the Big Springs subdivision, Village in the Glen. The would be criminals were chased off by the homeowners before they could steal anything. It was a teenage girl and 2 teenage boys. Remember: Call the police immediately if you see anything out of the ordinary. Below are the latest Crime Statistics provided by the SAPD.